Have You Visitied Our Other Sites? Pirate Cove is just one of four siblings in the Adventure Experience family. Along with out three sister sites: Jurassic Falls, Dinosaur Escape and Dinosaur Safari we make a very strange family of pirates and dinosaurs. Although we are very competitive siblings (what siblings aren’t? ), we all admit that each of our sites had its own shining treasure which will have you venturing to new places in no time! So, what kind of adventure are you looking for today? 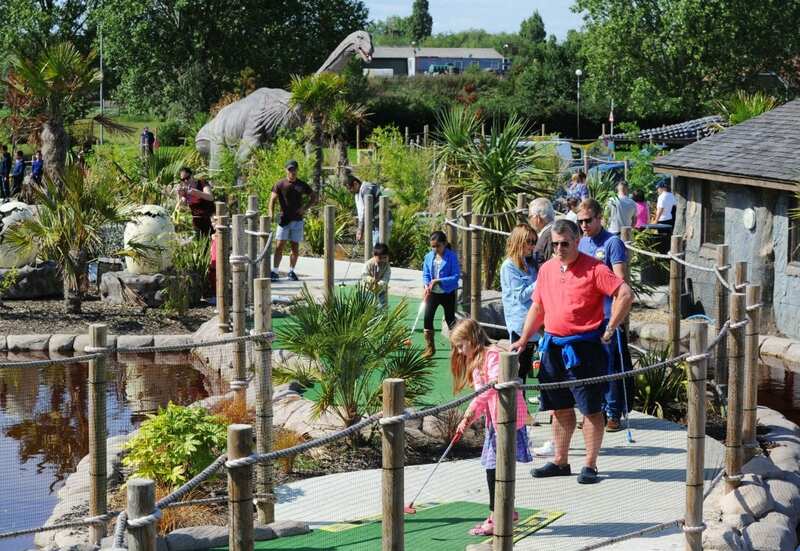 Dinosaur Safari Adventure Golf is located within 200 yards of the Borehamwood exit off the A1, and is clearly visible from the A1 dual carriageway! Spend the day starring in your very own version of Jurassic Park. Okay, if your picturing the end of that film let me stop you right there…What we have in store for you is way better! Come and join us in our very safe Dinosaur Escape where you can play adventure golf like a Hollywood star while watching Dr Dino breed new baby dinos! Don’t worry if any little ones get out, we only have the friendliest of dinosaurs around. Dinosaur Escape is located at West London Golf Centre, Ruislip Rd, Northolt UB5 6QZ easy to find by Road. Venture through a Jurassic jungle, the weather’s hot, the flowers are blooming and what’s that you see? A bird? A monkey? No wait! That’s definitely a dinosaur! After a fantastic round of adventure golf, you can swing up top with the Pterodactyl at Altitude Adventure Sky Trail, a 32ft high ropes course. If you’re looking for something closer to ground level, head over the Mini Quad Safari where you can take a ride one of our Safari themed carts. From Zebras to tigers we’ll have your favourite animal so why are you waiting! No matter what you chose all this and more can be found at Jurassic Falls. One day your sailing your ship out in the open ocean until you spot a beautiful castle on the horizon and decide to set sail towards it! What will you find? Well the grandest treasure of them all! A quest! Whether you want to tackle the high seas on an expedition for treasure on trusty pedalos or you fancy looking for fellow mermaids in a relaxing electric boat, the lake at Pirate Cove is the one for you! If you’re a scallywag who prefers dry ground, then there’s two18 hole courses for you to fight your battles on. If travelling to one of our other sites is too far for you, fear not sometimes the dinosaurs come to visit us! If you look carefully on your adventure to Pirate Cove you might spot some dinosaur footprints. Whenever you see these, it means our cheeky siblings have been playing golf here in the night. Well I did say we were a competitive family and what’s best for a competitive family? Adventure Golf! So, it’s up to you! Where will you be headed today? All we know for sure is that no matter where you chose you’ll have an extraordinary adventure!